Belize NMS: Moist and unstable conditions lingers over the area. 24-hour forecast: Cloudy with some showers, periods of rain and isolated thunderstorms today and tonight. 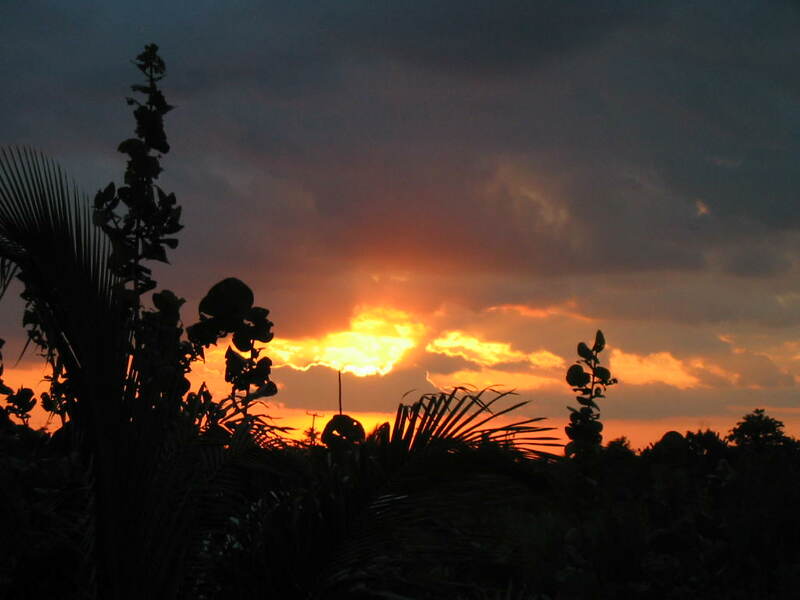 General Outlook: For Wed. is for cloudy spells with isolated showers or thunderstorms. A few showers and isolated thunderstorms will develop over the south Wed. night. Daily Tropical Weather Outlook: Tropical cyclone formation is not expected in the North Atlantic, the Caribbean Sea or Gulf of Mexico during the next 48 hours. 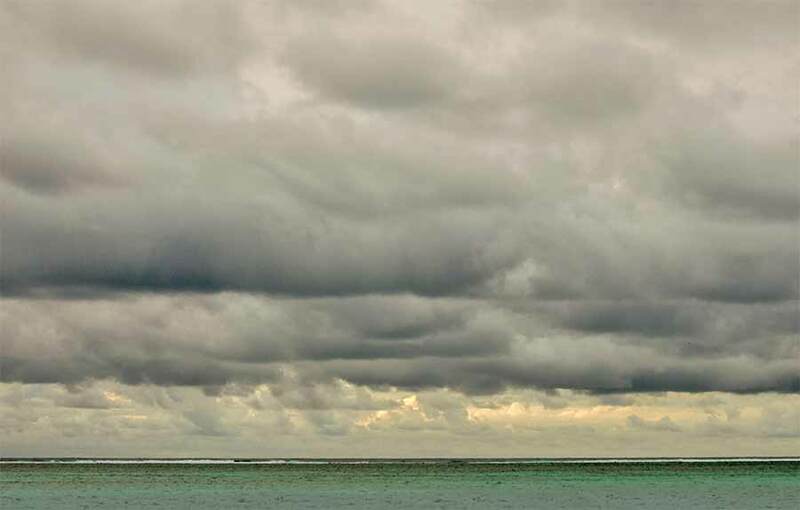 Today 10-20 kts Moderate-Rough 5 ft SOME SHOWERS, PERIODS OF RAIN AND ISOLATED THUNDERSTORMS. Tonight E-SE 10-20 kts Moderate-Rough 6-7 ft A FEW SHOWERS AND ISOLATED THUNDERSTORMS. Tomorrow E-SE 10-20 kts Moderate-Rough 6-7 ft ISOLATED SHOWERS OR THUNDERSTORMS. Outlook E 10-20 kts Moderate-Rough 6-7 ft A FEW SHOWERS AND ISOLATED THUNDERSTORMS, MAINLY SOUTH. For more on Tropical Storm Franklin, CLICK HERE. Last edited by Marty; 08/09/17 06:13 AM. On Ambergris Caye this morning we have a 6 mph breeze from the SW. The expected high is 87 f.
I took one of the boats to the reef this morning. There are still some big waves and surge from last nights storm. I doubt if we will have diving weather until tomorrow. Checked out the beach by my house this morning - very clean - Franklin took most of the sticks and sargassum away. A little erosion observed in a spot or two. Will make a better survey of area after we get the boards off my doors and furniture back on the veranda. Many thanks to everybody who took this seriously and did al the right things. That storm could have landed on our heads, in which case we'd be doing very different things this morning. And MX? Any word yet? A weakened Tropical Storm Franklin chugged across Mexico's Yucatan Peninsula Tuesday, dumping heavy rain after coming ashore on the Caribbean coast. The National Hurricane Center said the storm's center was 75 miles northwest of Chetumal and moving west-northwest at 14 mph (22 kph) Tuesday morning after making landfall overnight. Franklin's maximum sustained winds had decreased to 45 mph (75 kph), but it was expected to strengthen again Wednesday as it crossed the bay of Campeche. Three to six inches (7.5 to 15 centimeters) of rain were forecast across the Yucatan, with localized amounts of up to 12 inches (35 centimeters). Franklin was expected to make landfall again Thursday, threatening flash floods and mudslides in mountainous central Mexico. The Quintana Roo state government had moved people from the most vulnerable coastal communities, Adrian Martinez, coordinator for the state's Civil Protection agency, told Milenio television. Shelters were prepared across the area, with one specifically designated for the residents of Mahahual, a popular beach destination. Officials had urged all businesses and gas stations to close early to help clear the streets. The state government closed the Chetumal airport near the border with Belize overnight. A tropical storm warning was posted for the Mexican coast from Chetumal to Sabancuy. Tropical storm-force winds extended up to 140 miles (220 kilometers) from the center. Aug 8 (Prensa Latina) The states of Quintana Roo, Campeche, Oaxaca, Puebla, Chiapas, Veracruz and Tabasco are coordinating actions today due to the lashing of Tropical Storm Franklin. Classes have been suspended today in several municipalities of Quintana Roo, in the Mexican Caribbean region, and the Chetumal International Airport closed operations due to the impact of Tropical Storm Franklin in that area. The Secretariat of Education in Quintana Roo confirmed the suspension of classes in high schools and universities in the municipalities of Othon P. Blanco, Bacalar, Felipe Carrillo Puerto, Jose Maria Morelos and Tulum. That entity said that in case of basic education, the beginning of the school year will be on August 21. School facilities and other public entities are under safe. Flights from Mexico City and other sites were suspended due to the closure of the Chetumal International Airport, capital of Quintana Roo and one of the main tourist destinations in the country. 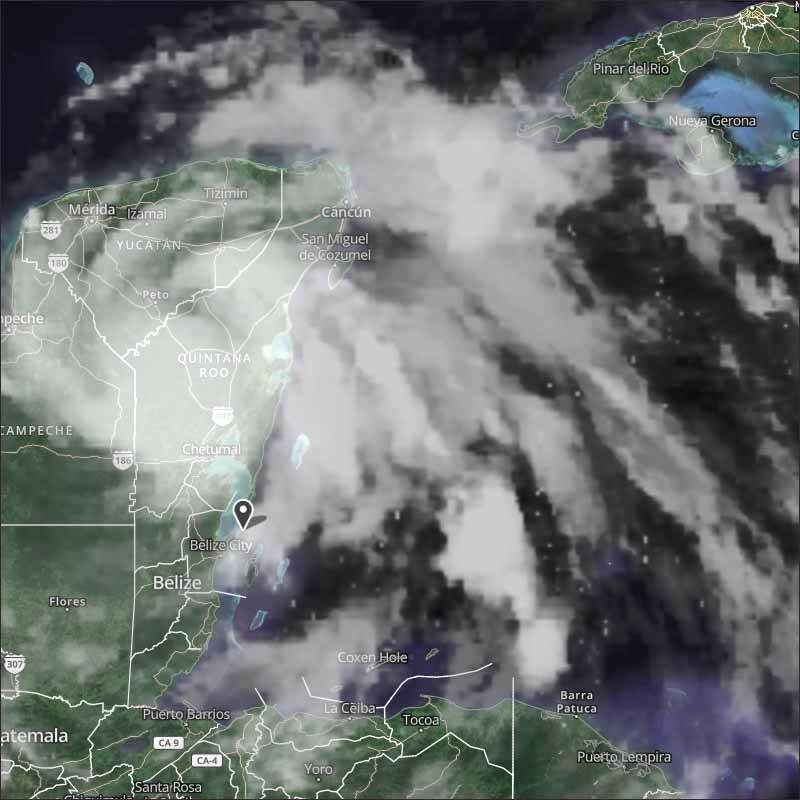 The Federal Electricity Commission (CFE) reported that an operation is being prepared to fight the effects of the tropical storm in the states of Quintana Roo, Yucatan, Campeche and Veracruz. Well that was the Tropical Storm that wasn't or was it. ? So TS FRANKLIN has now passed and is crossing the Yucatan, heading for the Gulf. Very little rain effectively on Belize and no wind. That was a strange storm, very large area of cloud effected, its main cloud area collapsed each afternoon into the evening, then built again at night into the morning. But only a very, very small actual storm centre. Strange. Looks like today will be cloudy for the morning, mid level cloud rotating from the SW, high level from the NE there could be the odd rain shower, but not a lot. These pictures are all around midnight as it was crossing the coast, the rain a little later. Heavy rain over Belmopan and the mountains, due to that line of mid-level cloud coming from the Pacific from the SW, with a little high level from the north, but the easterly Caribbean wind has been snucking in under those, and when going up the mountains, results in a line of rain. Belize City getting some, but Belmopan most. On Ambergris Caye It's been raining hard for hours with a lot of close thunder and lighting. Water is backing up and the road North is flooded. (4:am wednesday).